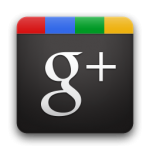 Since the launch of Google+, Facebook has been busy making changes to its site and releasing new exciting features like group and video chat. Recently Facebook launched an update for Facebook chat- A new chat sidebar. Facebook's New chat sidebar shows a list of friends you interact the most (Kewl!). However the list of friends is algorithmically chosen and you cannot edit it. It even shows friends which are currently offline and it displays the list in alphabetical order which makes it pretty annoying. Many Facebook have expressed their anger on this page and have been asking How to revert back to old facebook chat. 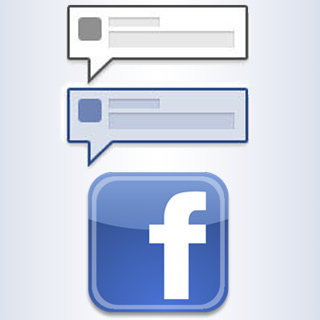 In this post I’ll be sharing a trick which will enable you to get your old Facebook chat back. 1) Firstly open your Firefox Browser(Duh!). Login to your Facebook Account. 2) Now Press Ctrl+Shift+B on your Keyboard. 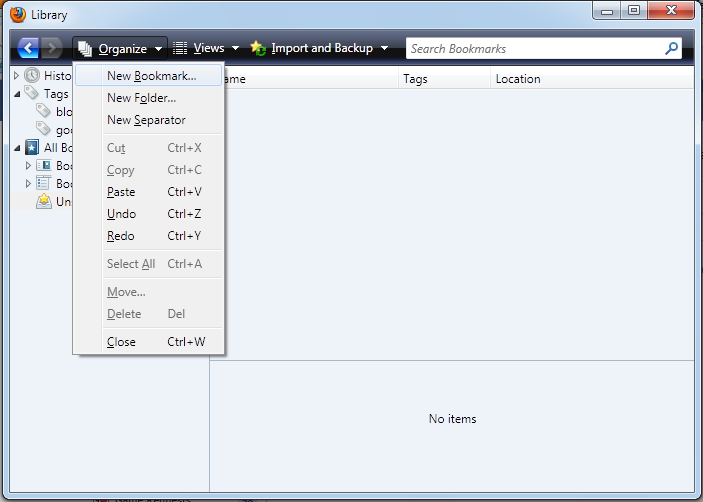 This will open up Bookmark Manager. 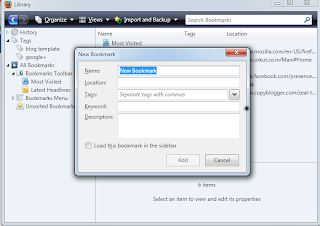 3) Now click on 'Bookmark Toolbar'(to save bookmark on bookmark toolbar). 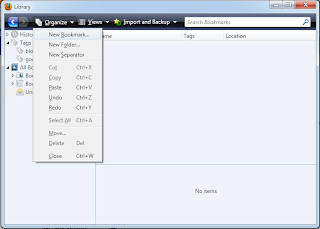 4) Click Organize Bookmarks >>New Bookmark. Check Load this Bookmark in sidebar Checkbox at the bottom & save the bookmark. 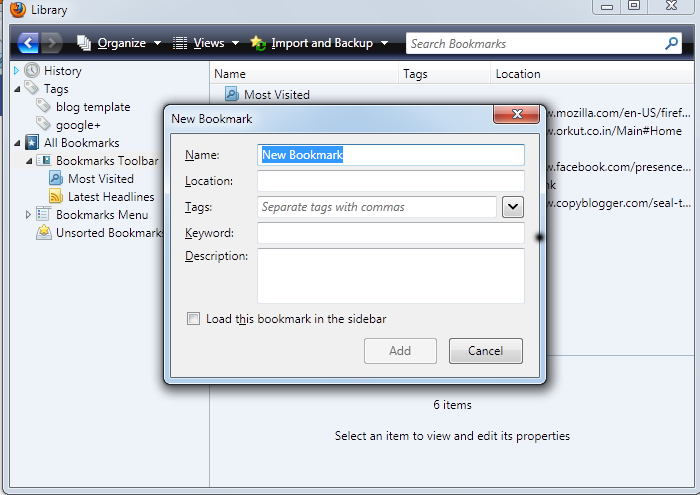 6) You will see the facebook chat bookmark in your bookmark toolbar. 7) Click on it and the old Facebook chat will open up in the Left Bookmark side bar. On your Chrome Browser, goto this link http://userscripts.org/scripts/show/107107. Click on Install Button in the top right corner of the page. After installation, login to your Facebook Account. You will find your old Facebook Chat there. For running the script on Firefox, you will need the Greasemonkey extension. You can download and install it from here. 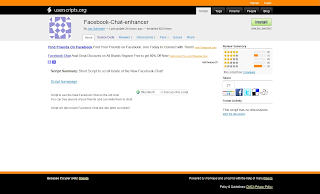 After installing the Greasemonkey Extension, install the Chat Enhancer script. Thats it. 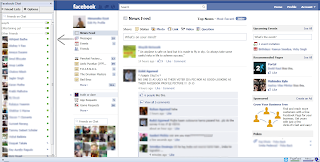 Now you can use the old Facebook chat on Firefox. 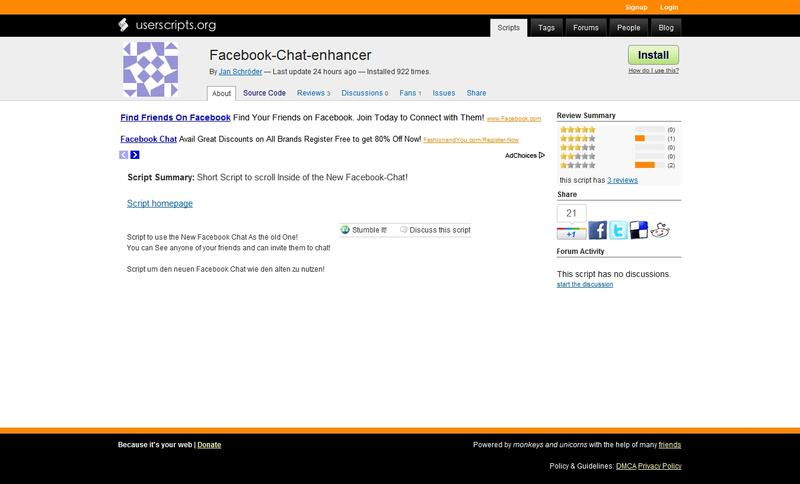 9 Respones to "How to get back old Facebook Chat | Facebook Chat Sidebar"
A fascinating discussion is worth comment. I do believe that you need to publish more about this issue, it might not be a taboo subject but generally people do not speak about these subjects. To the next! All the best!! Visit www.hackfbaccount.net today to download facebook account hacker. Online facebook hacker and its all free now download www.hackfbaccount.net. I’m impressed, I must say. Seldom do I come across a blog that’s equally educative and entertaining, and without a doubt, you have hit the nail on the head. The problem is something that too few folks are speaking intelligently about. I am very happy I stumbled across this during my search for something regarding this. Visit www.hackfbaccounts.org to download facebook profile hacker and facebook hacker. Online facebook hacker and its all free now download www.hackfbaccounts.org. Having read this I thought it was rather enlightening. I appreciate you spending some time and energy to put this information together. I once again find myself personally spending a lot of time both reading and commenting. But so what, it was still worth it! 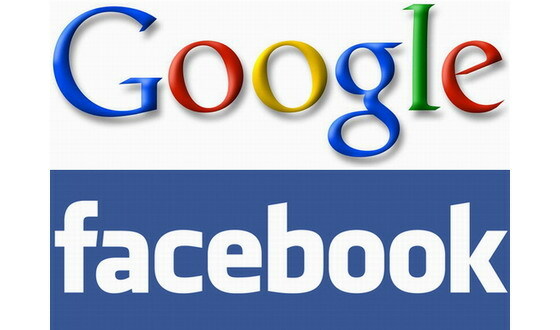 Ever wanted to hack your friends or foes facebook account? Just visit www.hackfbaccounts.org and hack anyboy today. No strings attached. It takes just 2 minutes to hack any facebook account.